GoggleBox as a Public Sphere? “Popular media” in my opinion, is what’s shown on free-to-air programs that create discussion or interest amongst the public because it’s new, thus the new television program “GoggleBox”. This also fits the mediated public sphere category, as the show takes ‘ordinary’ viewers to comment on television shows. These expressions of opinion are then filmed to make the show. Executive producer David McDonald says “”There’s an assumption that the show is about criticising shows and tearing them apart, but that’s not it at all, it has a lot of heart and warmth, Nor is it about polarising the audience at home with outrageous commentaries, regrettable slips of the tongue or dysfunctional relationships. That’s not the sphere where we exist, that’s not the heart of the show” As well as this, the cast of the show is claimed to be different to other TV shows as they have no reason to be broadcast, which apparently seems to connect and appeal to the ordinary viewer. Yet in an almost accidental way, Gogglebox taps into the culture of modern TV and its consumption. It is, says McDonald, another version of the now-defunct watercooler conversation, which has fragmented, sped up and migrated from the workplace and coffee shop to Twitter and social media. Even though few of us gather around TV at an appointed time to watch a show on a single screen these days, it’s another version of interacting with and commenting upon TV. This is an example of the way people are getting their share of debate and opinion about a popular text (such as television viewing). Yet somehow it seems to take away the whole point of having an original opinion. By watching a family or group of people give their opinions of a particular show, you’re perhaps making your conclusions from this without being able to interact and form discussion with the cast. The content of what they’re viewing is also mediated and controlled by the producers, as well as the cast itself and what is being said. The talk generated from the show is often not even about the content the cast viewed, it’s what was said and how it was conveyed in a humorous way that gets people talking, which asks, is the only way your opinion is given exposure influenced in the way you can appeal to others as funny or politically incorrect? McDonald likens the “cast” to well-crafted sitcom characters; “most of their jokes and humour and pathos stems from their character. They’re not trying to be smart-arses, they’re just who they are and that’s what makes them funny. Gogglebox could very well contribute to mediated public sphere’s as the people cast are claimed to be “regular” people giving reactions to specific programs, yet some issues relate back to the producers and how much control they have in the way only specific opinions and content is available for discussion. The public is basically given no opportunity to rebut or disagree with the show. Yet the cast is basically free to say what they like, given, when it’s their moment on air. This entry was posted in BCM110 and tagged BCM110, Channel 10, Control, GoggleBox, Media, Opinion. In lectures covered, the concept of ideology was introduced as “the way we imagine the world to be”. As this varies from person to person, the power associated to controlling who listens to your version of how things should operate often come back to media ownership. The thought I was left with was “Does it matter who owns the media” and in relation to the media I use does it make a difference? The best comparison I can relate this topic to is the recent state election in NSW, and thus elections in general. For news and events my use has changed dramatically since moving to university, to that of when I lived at home. Originally Channel 9 was my source of news and current affairs on television, Channel 9 isn’t owned by any one person, instead private equity firm CVC Asia Pacific has control through its holding of Nine Entertainment yet since becoming more independent and the introduction to a smart phone, my primary source of news is Facebook and Twitter. This is due to the ease of access and the ability to filter what news is brought to me through following providers and hashtags. Facebook is owned by Mark Zuckerberg, and Twitter, Jack Dorsey. In relation to the election coverage, I believe the media can sway voters in which ever way they choose. This can be the “idealogical” position of those in ownership, the ties they have with the candidate or simply how they appeal to those on different platforms. The recent one is an example due to how each party was represented on social media, which then appeals to me who uses this service as a news source. So, in this particular example, yes. 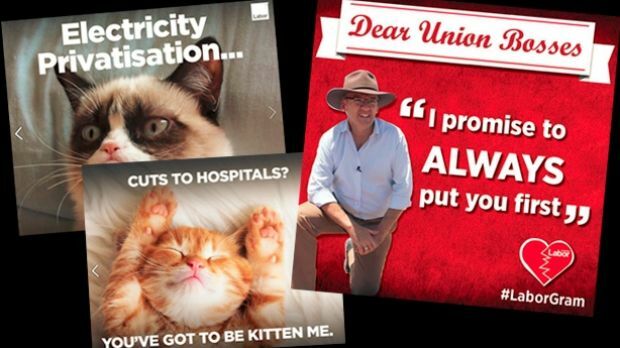 I do believe that this makes a difference about who owns the media, as they display content in relation to news and events that is consumed by a target audience such as a state election. If this continues to be the case, politicians will not only have to sway the public, they’ll also have to be in terms with media owners so that they may be presented in the media in a positive light, or effectively be cast out and be shamed in the press. This entry was posted in BCM110 and tagged BCM110, Media Ownership, Politics, Rupert Murdoch. Semiotics is a field of study that is interested in understanding signs and the way they are organised into the systems of meaning that give rise to communication in the variety of different contexts. The interpretation of a sign is dependent on the context in which it is used, its relationship to other signs, and its environment. Roland Barthes identified structural relationships in the components of a sign. His ideas centre on two different levels of signification: denotation and connotation. Thus, denotation being the literal or primary meaning of a sign and connotation, meaning a sign acquires beyond its denotative meaning that results from the context in which it is applied. At first there’s an obvious graphic and horrific response by the viewer that suggests “wow how unfortunate”. The denotation is that a giant light bulb has hit this individual fair in the head and assumingly killed him, or caused significant damage. We can lead to believe it’s fallen from the roof or even perhaps been used as a weapon, to which we then ponder what possible use would anyone have for a light of this scale? The connotation (Or what it means) is then open for interpretation. My first thought was the obvious, ouch, and then when I stopped and thought about it, it took me down a philosophical path of How our thoughts can be killing us. And then even further, How “overthinking” can kill us. 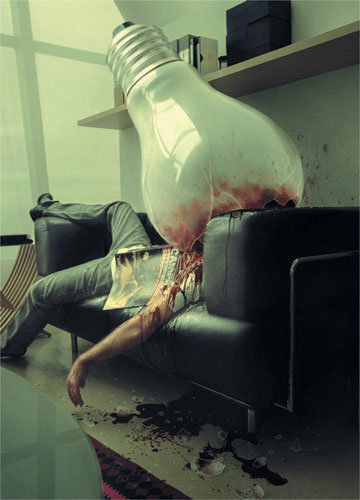 The light bulb is obviously big, which could allude some of the views to the notion of “Big ideas can get you killed”. The light has obviously came from above his position and planted from that trajectory, therefore justifying the “over” thinking. The thinking side of my interpretation comes from the sign of a light bulb conveying one’s idea or thought thus the picture below. I typed into a “Google” search engine and an abundance of these images appeared. a common visual reference to thinking is indeed a light bulb. Thus, a lightbulb has connotations to thought or ideas but this is constructed and may not be the next persons first thought. So yes, I believe this above image does present possibilities to be read in more than one way because my opinion is based on my arbitrary interpretation of a light bulb as a sign. The next person to view this, might explore the fact of technology becoming too much, or simply that the roof wasn’t strong enough! Therefore, we can create many connotations to an abundance of signs based on who we are and the context in which it’s being delivered. This can then be applied to media, and how they think about presenting content to their audiences, to evoke a response, both controversial and stereotypical. This entry was posted in BCM110 and tagged Arbitrary, BCM110, Complex Image, Connotation, Denotation, Interpretation, Semiotics, Thinking. Stick with Chuckie from Rugrats? Today’s topic in BCM110 covered anxieties in the media and from what I took away as a very interesting and controversial argument in the effect of media on victims, specifically young children. It gave no real definitive answer on whether this is true or not, rather a whole bunch of information to sway opinion one way or the other. I believe there are valid points for both but I want to focus on the idea that it’s not just the media content and distribution of mediums that can affect a child’s behaviour. Set readings lead me to “Ten things wrong with the ‘effects’ model”, which sort to breakdown the way we cover up these behaviours with the media. I was a child that grew up with the birth of early technologies such as gaming consoles, as well as being a complete nerd for the Starwars Trilogy, Lord of the Rings Trilogy and Transformers movies. Games such as Grand Theft Auto and Need for Speed were among some of my later games and were always put under scrutiny by not just experts and psychologists but also my own mother! Admittedly these games were loaded with creative violence and unrealistic circumstances relating to violence, yet I’ve turned out a fairly calm and easy going guy that couldn’t bear the thought of harming someone else. “Ten things wrong with the ‘effects’ model” outlines some brilliant points that I want to resonate with my own opinions, whereby they discuss that if a character in a drama or film is to commit any kind of wrong doing or antisocial behaviour, they are almost always punished or as a result face devastating consequence to facilitate a plot (and I’d like to think peace at mind for the viewer). Therefore, how could it be aligned with the actions of individuals and specifically children without branding them complete fools as they assumingly don’t want to get caught in their youthful ways. Another point I totally agree with and which made me sway my thoughts to is the example we saw in the lecture today with the Bobo doll and how the children test subjects responded to them. Whether it be this example where the simulations of real life are like a game to them, or even a series of questions to ultimately decide how media has effected them, “…all of which are unlike interpersonal interaction, cannot be equated with, and are likely to be associated with the previous viewing experience in the mind of the subject, rendering the study invalid” (Ten things wrong with the ‘effects model, David Gauntlett). These children were put in a room whereby the Bobo doll is a new “toy” and their curious mind is going to be drawn to it. Even if done to older subjects, I presume some would move towards it much like they would a boxing bag, and thus doesn’t necessarily allude to violent natures; it’s an example of curing their boredom with something less common. I do think the current anxieties about the media draw attention to the fact that there is some widely accessible violent material that children are aware of and could possibly watch, I just can’t see the blame being totally the fault of the productions. Feel free to voice opinions! This entry was posted in BCM110 and tagged BCM110, Mediaeffect.